Successfully Added 8GB MP3/MP4 Player + Scroll Control - 2.7 inch LCD to your Shopping Cart. 8GB MP3/MP4 Player + Scroll Control - 2.7 inch LCD. 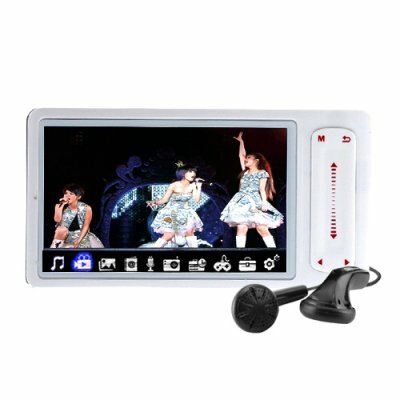 8GB Portable Media Player (PMP) with crisp TFT LCD screen and convenient vertical scroll. Wow, this baby has so many entertainment functions and features, where do we start? Lets begin with an easy to use vertical scroll bar and color icon interface for accessing music, videos, pictures, e-books, and the portable data storage manager. If you enjoy watching videos, then the crisp 2.7 inch TFT screen is a thing a beauty. Reading and viewing pictures is also a pleasure with the bright and crisp LCD, and can be easily shared with friends sitting next to you. Playing your music and video collection is simple and fun with the simple store and go design of the functional USB connection to the unit. Just load it up like you would any flash drive or SD card and you are ready to enjoy hours of your favorite entertainment! This is a digital media player with an incredible amount of potential for fun and for practical applications, and is available for a much lower price than you would ever get for a branded PMP, with even more functions. So click "Add to Cart" right now to instantly preview the shipping rate to your country and have us ship this wonderful new digital media player to you today! 2.7 inch screen; slim body; ultra portable media player. Easy to load your music and videos from any Windows PC. Bonus: Premium quality gold plated earphones now included!